Baltimore City implemented a 311 system in 2001. But this wasn’t just a call center, it also included citizen web reporting. Over 75 public services, from streetlights and potholes to water breaks and missed trash collections were cataloged, and tracked for results by the CitiStat program. 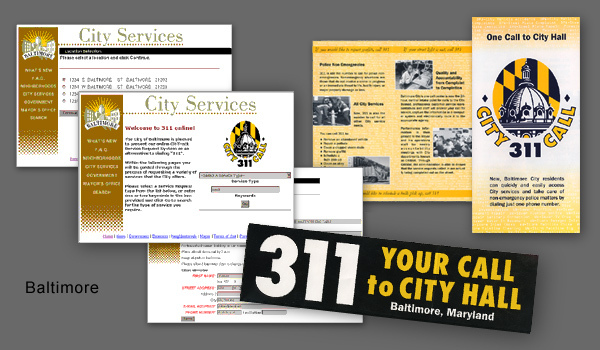 In 2001, Mayor Martin O’Malley launched the current One Call Center, expanding 311’s use beyond just police matters to all city services. The software links into CityStat, which is designed to track complains and results. Department supervisors must answer to their higher-ups about the number of complaints and their outcomes. I didn’t know it at the time, but Baltimore was the first city to implement 311 service as a non-emergency hotline – 50 Things You Probably Didn’t Know About Baltimore.